There are many ways of thinking about composing, sounds and connecting one chord to another. I will do my best to explain a useful effect that can be applied as well as concepts which helps me when transcribing, composing and arranging. First of all, I would like to share some fundamentals; the modes of the Major Scale as I see it, complete with chord symbols and slash chords. I will list these in the original (functional) order, but also in an (Modal) order ranging from the brightest sound to the darkest. The order in the picture represents each mode as we play the C major scale from C – B. e.g. Play E-E = Phrygian scale, etc. etc. 2. an inversion of a chord, creating a particular sound. This could for example be ‘5 over 1’ i.e. C/F. It could also be Cm/Bb, and this particular voicing, wants to go Aø – D7(b9) – GΔ. The scale representing the inversion Cm/Bb can suggest the use of either C Dorian or the C Aeolian scale. The Bb is not the start of the scale (it’s just an inversion of Cm7). Here’s the list of the compulsory slash chords related to the Modes of the Major Scale, but using intervalic numbers, which may be an easier way to remember them. This knowledge will help us to determine whether a composer is referring to a particular scale or simply just an inversion. Voicing Tip: Including the 4th in a voicing, often represents the sound of the mode clearer than the 5th. FΔ#11/C represents C Ionian, but you could in fact play this chord only (4th step of the scale) whilst changing the bass note, according to which mode you wish to represent. Theoretical fact: When we tritone substitute the V in a II-V-I, we should include the note of that original chord that we substitute. This will give us the most IN-sound to play on the substitution – the Lydian Dominant scale. In the key of C, the G is such a crucial note as part of the cadence to C.
A straight Db mixolydian (Db7) scale would in fact lead to the key of Gb. However, this could be your choice of sound in a specific context. But knowing the importance of the G creating a Db7#11 is important. The Mixolydian scale is a more angular choice, but would sound ok.
Bar 1 and 2: introduce minor keys – relative minors to chords in bar 3. The phrygian chord is a nice transition to the harmonic minor chord. Bar 3: here we are introduced to the relative majors of the minor chords in bar 1. Bar 4: we are reminded of the original mood as in the beginning of the sequence. The phrygian scale helps the improviser to shape his phrase into the harmonic minor sound at the end of bar 4 before modulating. The note F is held by the phrygian slash chord before resolving to the note E. Coming from DbΔ, the improviser can still use the Ab ionian scale on the phrygian chord because it’s the third degree of Ab, i.e. the Db bass note descending to the C, creates a minor sound, leading smoothly into the F Harmonic minor scale, just before modulating to A minor. Bar 5: “Resolution”. New refreshing colour / sound to the piece and gives the sequence more shape and adds variety. Bar 6: Reminder of the relative major sound related to the original mood / key of the piece. 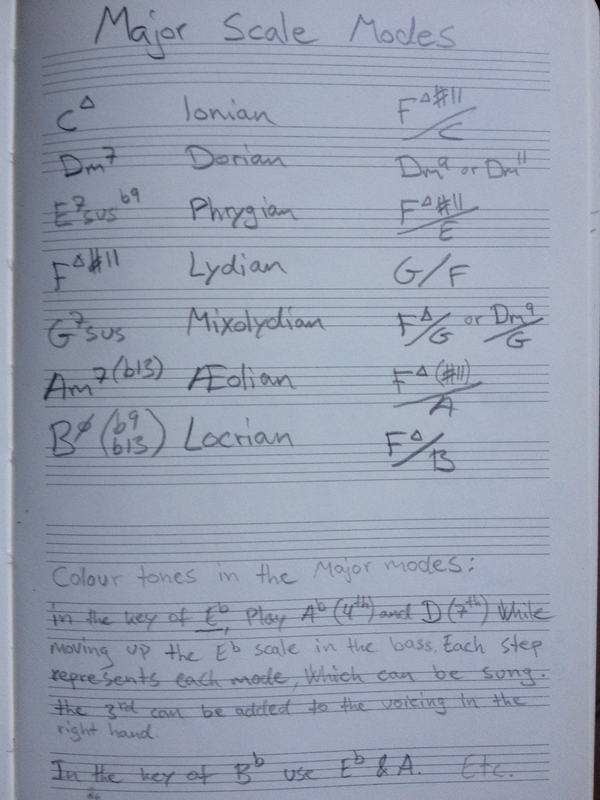 It’s very common to improvise using the lydian scale on major chords, but not always the most effective solution – the decision should always be made with consideration to the surrounding harmony and context. context context context. (in this case, Bobo Stenson uses lydian which is the best sounding solution). Bar 7: this bar functions as a transition, moving back into the minor mood/key of the piece. Bar 8: a brief movement from major to harmonic minor, which prepares our ears to go back to the top of the sequence.. The bottom line: adding 3 or 4 sharps (or resolving 3/4 flats) to a current tonality will give us the most notable change of scene/colour, or whatever you want to call it.